I have always loved Chicken Parmesan but never made it until recently (in the last year or so). I guess I just always thought there was too much work involved in making it but it is sooo worth it. 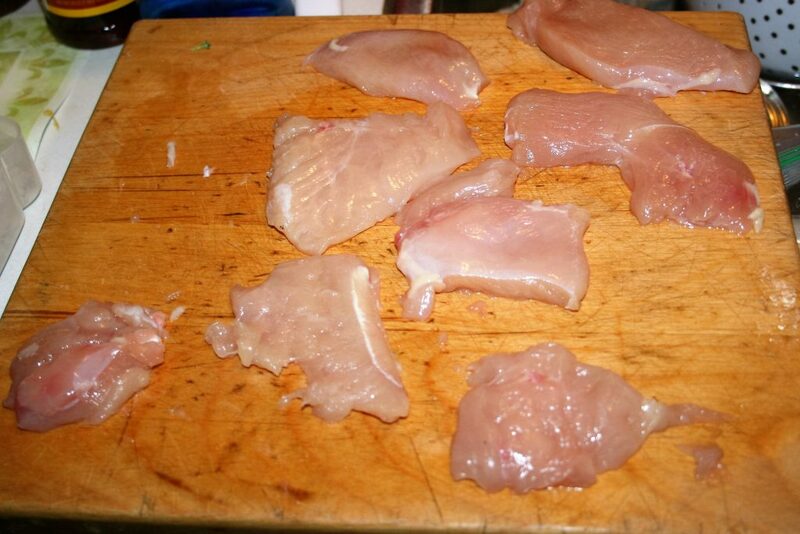 The first thing you need to do is cut your chicken into thinish slabs or pound it thin. I don’t like to pound my chicken breast. I prefer to use a sharp knife and slice it horizontally and then into single size pieces. The chicken breasts I get are about a pound each! So I cut it into at least 4 pieces: in half horizontally and in half vertically. The thinner you cut them the quicker they cook. I took these pictures a while ago, so I don’t remember exactly how much meat there was but this looks like it was about a pound and a half or two pounds. This next picture is really poor quality but it is the best one I had to show the breading station. Put about 1/2 cup flour in one flat container. One beaten egg and about quarter cup of milk in the second flat container. And then about a cup to a cup and a half of Italian bread crumbs in the last flat container. 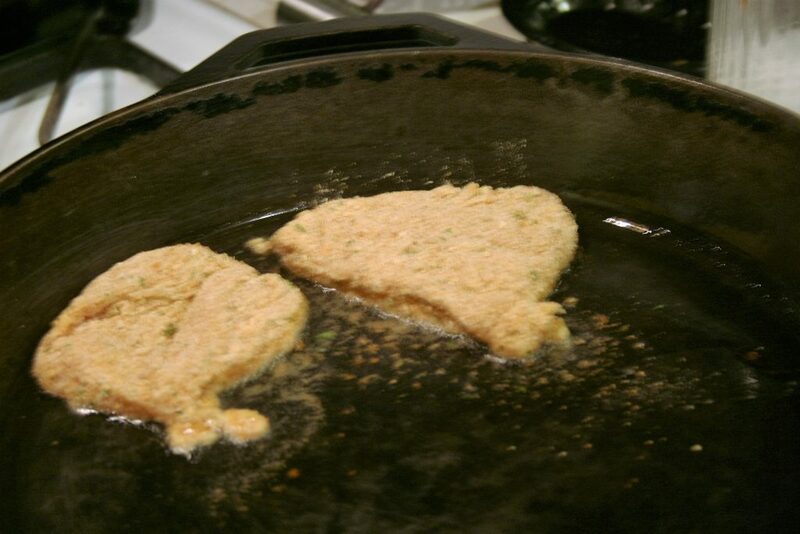 Put a couple of tablespoons of oil in a skillet and turn the burner on to medium-high. We used coconut oil this night. 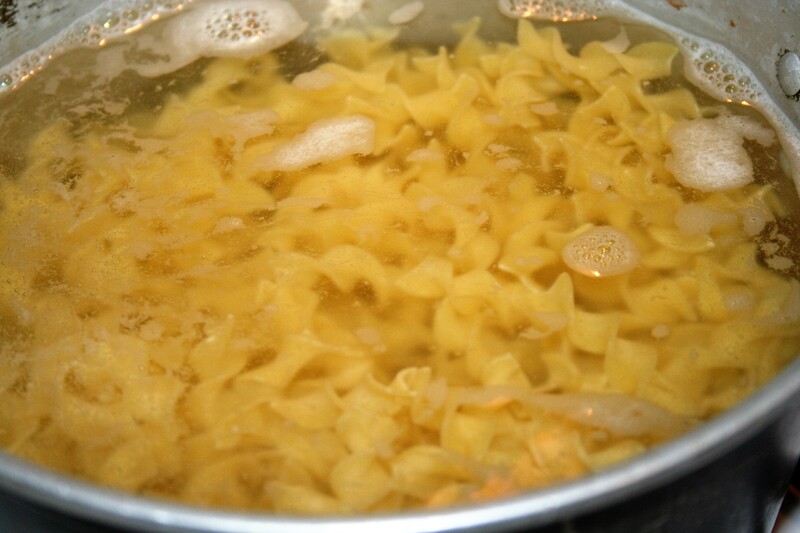 Also put on a pot of water and bring it to a boil, to cook your noodles. Now, place your piece of chicken in the flour and coat all sides. 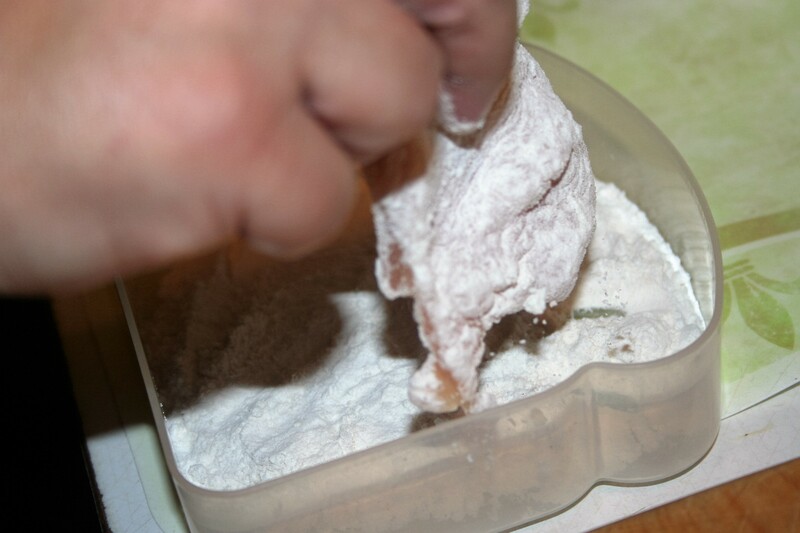 Then shake it slightly to let excess flour fall back into bowl. This will act as glue to hold on the breadcrumbs. Then place in the egg/milk mixture and turn to coat fully. Let excess drip off. 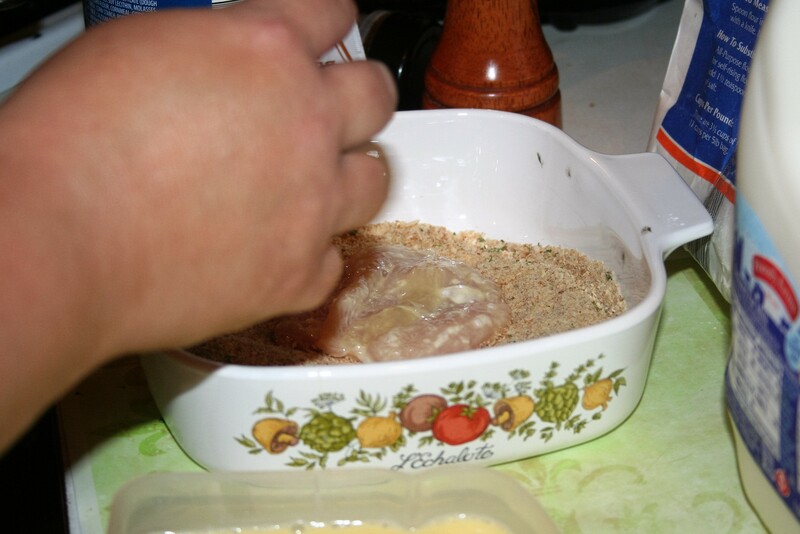 Then place in the breadcrumbs and coat thoroughly. Pat it on, if you like. 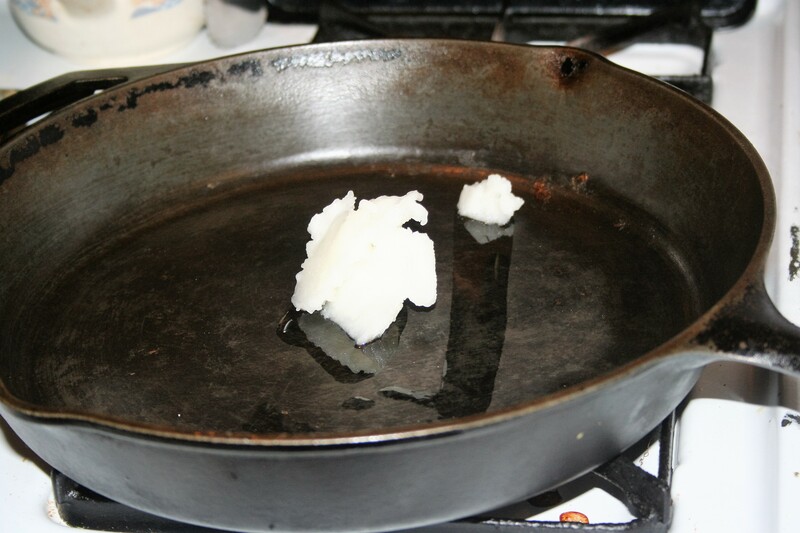 Place into skillet with hot oil. 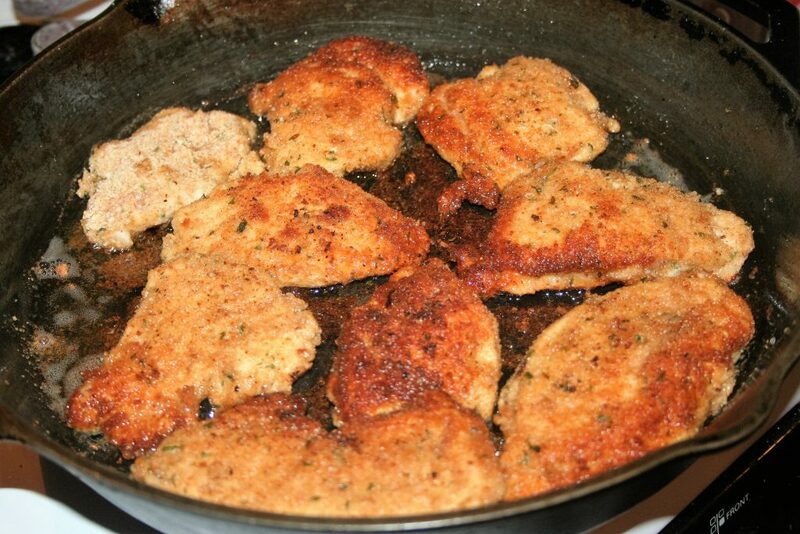 Continue this process until you have all your chicken breaded and placed in the skillet. Turn them over when the first side is golden brown. You should start to see the edges getting done and may see some juices forming on the top. Keep an eye on the heat of your burner, turning it down if it is browning too quickly. Add more oil as necessary to continue frying. These should not take very long to cook through if you cut them thin enough. Remove them from the oil to a baking sheet. Spread some of your favorite tomato sauce on top. If I am feeling energetic, I’ll make some of my pizza sauce but otherwise we like Del Monte’s traditional sauce in the tall can. You don’t want a whole lot of sauce, just enough to accent the flavor. The chicken is the star here not the sauce. Shred some Parmesan cheese and sprinkle it on top of each piece. Hmmm, I’m not sure that is Parmesan that I used that night. It looks like quite a bit. This particular night I added some Provolone cheese as well. 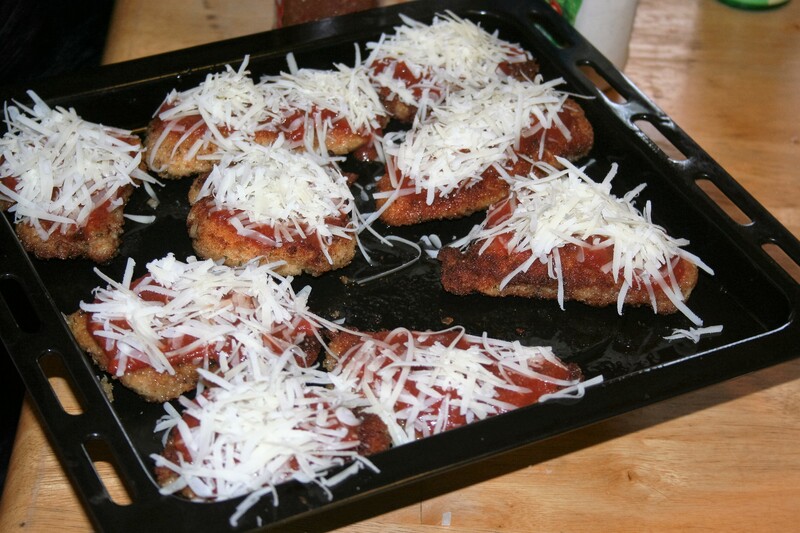 Pop it under the broiler to melt the cheese and heat the sauce. Meanwhile make sure your pasta is about finished and heat up the remainder of the sauce because you will probably want it on your noodles too. 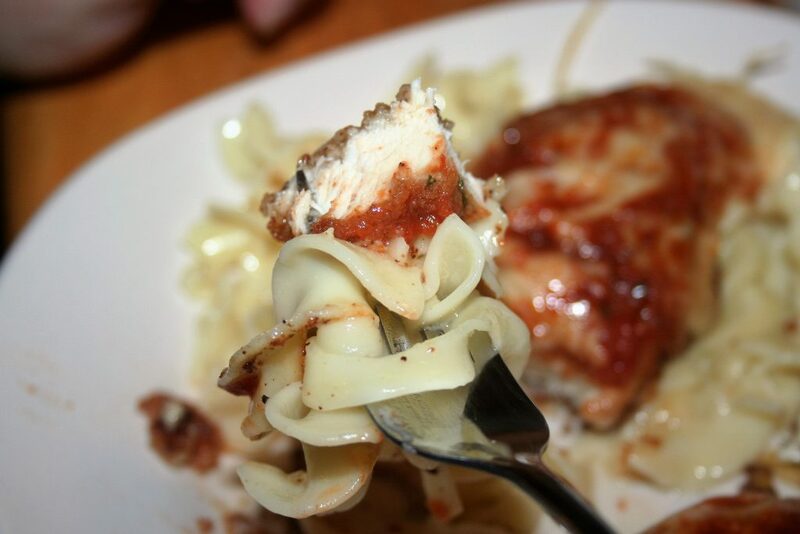 When the cheese is melted it is ready to serve. I like butter on my noodles. Combine your egg and milk in one flat container. 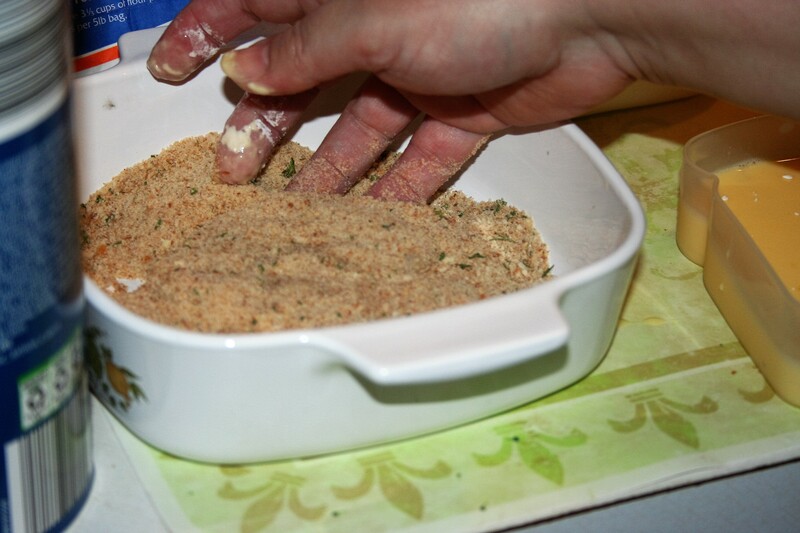 Place flour in another flat container and breadcrumbs in another. Dredge chicken in flour, then egg, then breadcrumbs and place in skillet with hot oil. Fry for a few minutes, until golden brown and then flip and cook on the second side. Remove from oil and place on baking sheet. 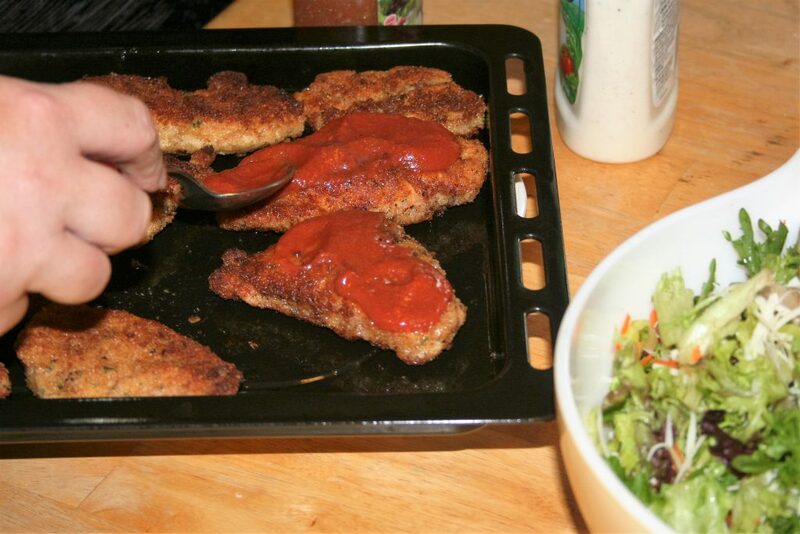 Spread a couple tablespoons of sauce on top of each piece. 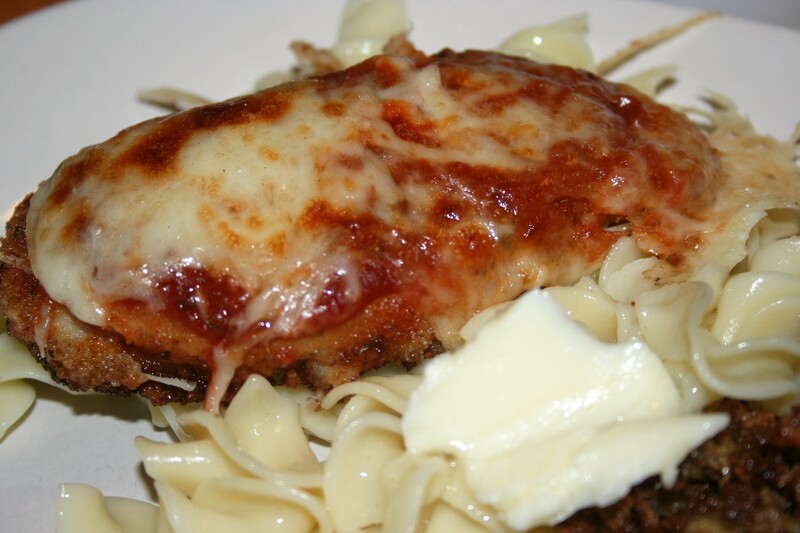 Sprinkle shredded cheese on top of sauce on each piece. 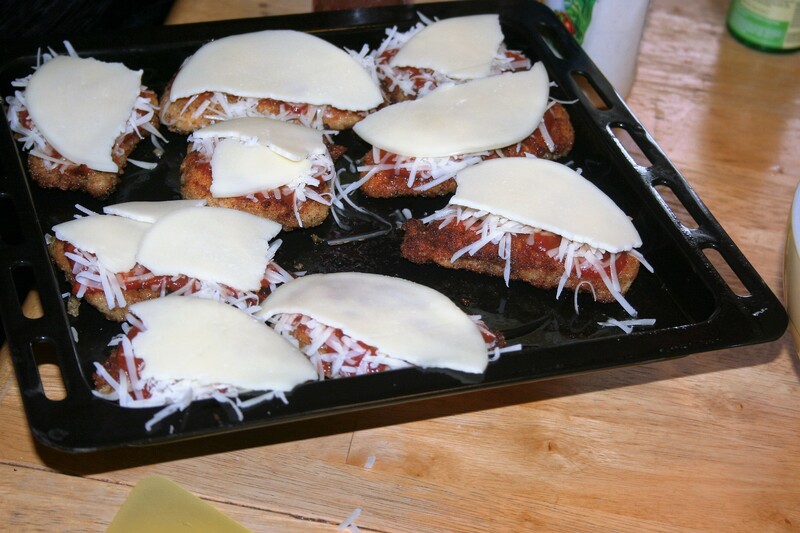 Place under the broiler until cheese is melted. Serve on cooked egg noodles, with butter or more sauce, as desired.